Notes: this option changes the font used for the notes, drum name abbreviations and drum kit key. 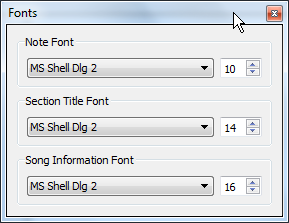 Section Title: this option changes the font used to display section titles. Song Information: this option changes the font used to display the song title, artist, BPM and tabber at the top of the score.